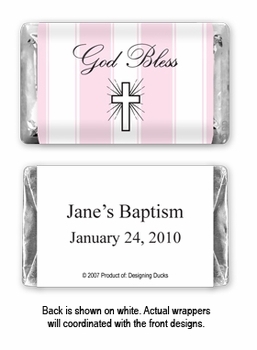 These Hershey's chocolate bar favors come with your own personalized labels and are perfect for Baptisms, Christenings or any other special event! Comes in the usual assortment of Krackel�, Special Dark�, Milk Chocolate, and Mr. Goodbar�. Please Note Allergy Information: These may contain peanuts. To prevent melting, all orders for chocolate favors may have to be shipped 1 or 2 Day Air once the order has been processed (usually in five to seven business days). Of course, it would depend on the current weather. Ice packs are also included in order to prevent melting during the shipping process. To avoid exposure to the outside elements, please make sure you are sending the package to an address where an adult will be available to accept the package. You must provide us with a working phone number and email address in the shopping cart, so we can contact you to finalize the shipping details required to ensure safe delivery. Please call us to discuss delivery options necessary to ensure chocolate items arrive in an unmelted condition.